A melody from the Simon Fraser Collection. This arrangement explores the use of Scottish bagpipe-style ornamentation. A port-a-beul Charlotte learned from the singing of Mary Ann Kennedy, which was recorded on their CD Strings Attached. A strathspey and pipe reel from the Simon Fraser Collection which Catriona arranged for an advanced competition in the National Mod syllabus. 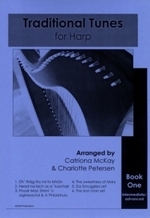 A Cape Breton style Strathspey which Charlotte learned from her Calluna flautist, Rebecca. Two traditional Shetland jigs which are favourites of Fiddler's Bid, of which Catriona is a member. The first of these is unusual, as the phrases are written in groups of three bars. The Iron Man is a strathspey by famous fiddler J. Scott Skinner. It can be played in a set with the reel, Miss Margaret Graham, or the two can be played separately.